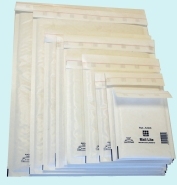 As stockists of Mail Lite postal mail bags, we have an extensive range of bubble lined, self seal mailers. Mail-Lite bags are available from stock in thirteen different sizes in both white and gold finishes. With minimum order quantities of just one box, click here to see the full range of sizes available. Larger quantities with personalised printing are available to order. In addition to our Mail Lite range we also stock a wide range of other postal packs including padded mail bags, polythene Mail-Tuff mailers, postal tubes, envelopes and self sealing book, CD and DVD packs made from corrugated cardboard. If you’re sending your pre-packed products through the post or using a courier network, we can also supply a range of shrink film systems and document enclosed pouches. To keep your product safe in transit don’t forget to see our extensive range of cushioning and loose fill products.